Jamie T is set for a comeback this month after being on a bit of a sabbatical since he last released a single way back in 2010. He published a picture of a hand written letter on the homepage of his website breaking the news of his return to the stage. The letter opens with "Hi everyone!!! I have decided it is time to play a few shows" before announcing 3 gigs in the UK at the end of July. 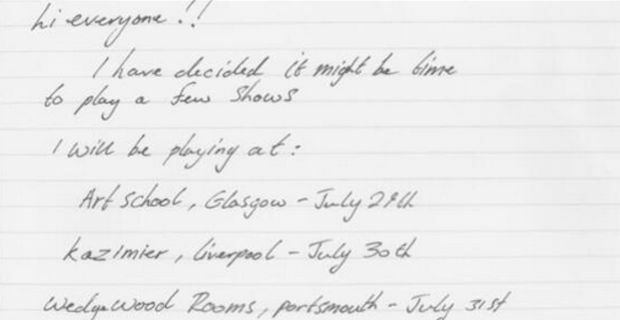 He then ends his note with "Hope to see you there, Jamie T."
The singer-songwriter is set to play across the country with gigs at Glasgow Art School on July 29th, Liverpool Kazimier on July 30th and the Portsmouth Wedgewood Rooms on July 31st. Tickets for the shows are on sale from today and you can purchase them through Ticketmaster. Jamie T was twice named Best Solo Artist at the NME awards back in 2007 and 2010 and the music world is eagerly awaiting the release of his third album which is currently in the works. His debut album Panic Prevention was an international hit as was his follow up album King & Queens leading onto his NME wins. He has a lot to live up to with his new material.